All that’s left for us to do is to have breakfast at ‘La Patisserie’. I fully intend to make that happen this very morning. Or tomorrow, just before we do the return leg to our road trip. The Culinary institute, the first culinary institute I’ve come close to is on a historic street close to the Niagara Falls State Park. It has three ‘eateries’, run by students of the institute. They say: Visitors to NFCI can enjoy Savor, a student run fine dining restaurant with an in-kitchen chef’s table, open hearth oven and exhibition style cooking; an ice sculpting lab, The Wine Boutique, featuring some of New York State’s finest selections; La Patisserie, a European style pastry café; Old Falls Street Deli, a New York style deli; and a Barnes and Noble culinary themed store. We lunched on sandwiches and salads at the Old Falls Street Deli. I had a Cobb Salad with boars head turkey! I’m sure Boars Head is the brand…and not a new type of turkey from boars. It was nice, and regular. Nothing fancy, just wholesome vegetables. During our daytime tour of the Falls, we drove past the culinary institute and our tour guide Dayna suggested we try the ‘Savor‘ restaurant for dinner. And I….am not one to pass up dining recommendations. We turned up to dinner at Savor without a reservation (thanks to my husband….you can imagine how that went) and had to wait 15 minutes which wasn’t too bad. The kids went straight into their mains – wood-‘stoned’ pizzas, hamburgers and chicken sandwiches with bowls of fresh fruit and kiddies cocktails while the husband and I had appetizers. He had an Arugula salad with Apples, Cajun Walnuts, Fresh Gorgonzola, Apple Cider Vinaigrette while I delighted in a Compressed Melon Salad of three Seasonal Melons (Watermelon, Cantaloupe and Galia chunks), Feta Chips, Almonds, White and Black Balsamic Pearls. Molecular gastronomy in Niagara falls. The feta cheese crisps were nice but not as salty as I expected and would have liked for a more striking contrast, neither were they as crisp as I would have liked. 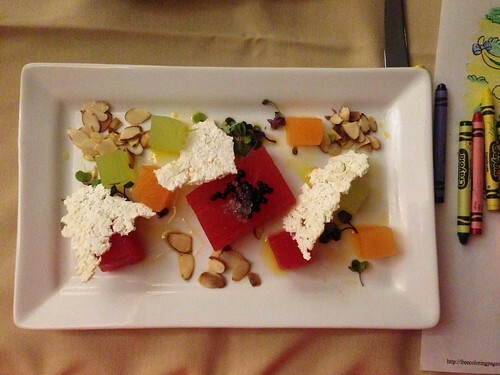 The melons were gorgeous – evenly cut and delicately adorning the plate. There was a drizzle of some light citrus dressing. The almonds were a great complement – chewy to the melons juiciness. I would have liked more almonds, and more crunch to the almonds. The garnishing microgreens were nice though I couldn’t figure out what they were. The brought some herby freshness to the overall dish. Verdict: I enjoyed it! in spite of my ‘suggestions for development’! 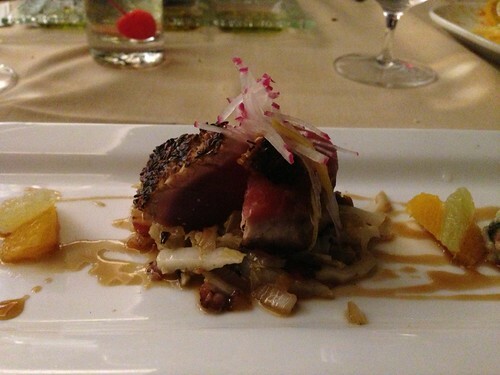 My main was a tasting plate of Three Variations of Hawaiian Ahi Tuna. 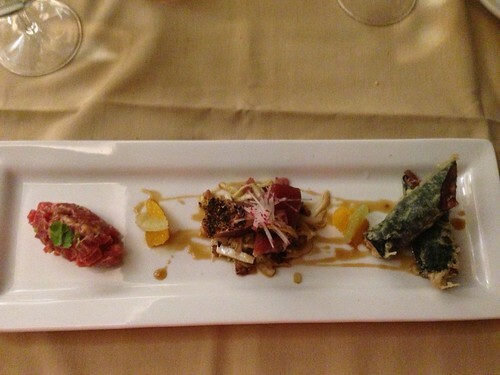 A Tartar with a Spicy Mayonnaise, Seared with a Sesame Crust, Napa Cabbage and Pancetta, In Nori with Crispy Tempura and Proscuitto. 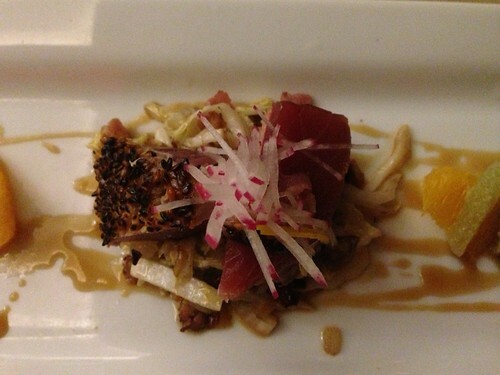 The winner of this dish was the sesame-crusted, seared tuna topped with julienned radishes…. And perched on a bed of super-delicious cabbage and pancetta. Pork makes all things delicious. It was juicy and flavourful and a perfect complement to the nutty sesame crust and soft, raw flesh. My next best tuna preparation was the nori-wrapped tuna tempura. 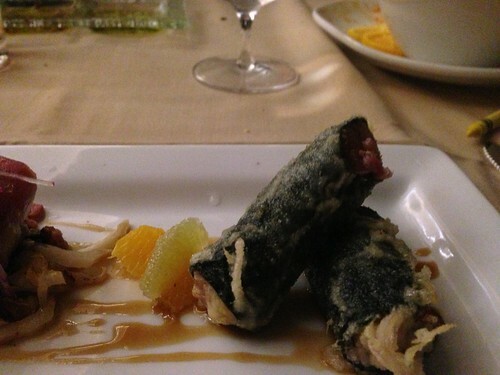 The proscuitto lent a nice salty component to the dish with the fresh ‘green’, vegetal quality of the nori wrapper. I love it but have to admit that the ‘tempura’ element was lacking. In both the batter and the crispness you expect of true tempura’, But I did enjoy it, in spite of that. Finally, the tartar. 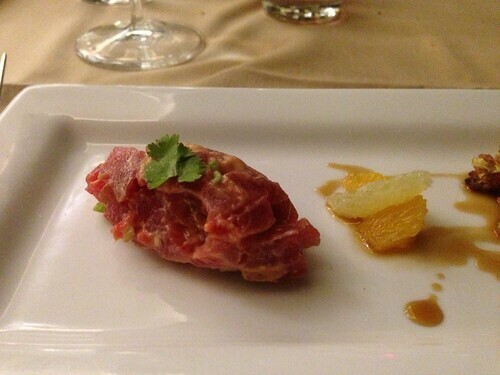 It was nice – a bit creamy and fatty – I’ve never had tuna tartar before so it was interesting. I scooped up bits of the orange and lime supremes to cut through the richness. I couldn’t eat it all but no regrets. 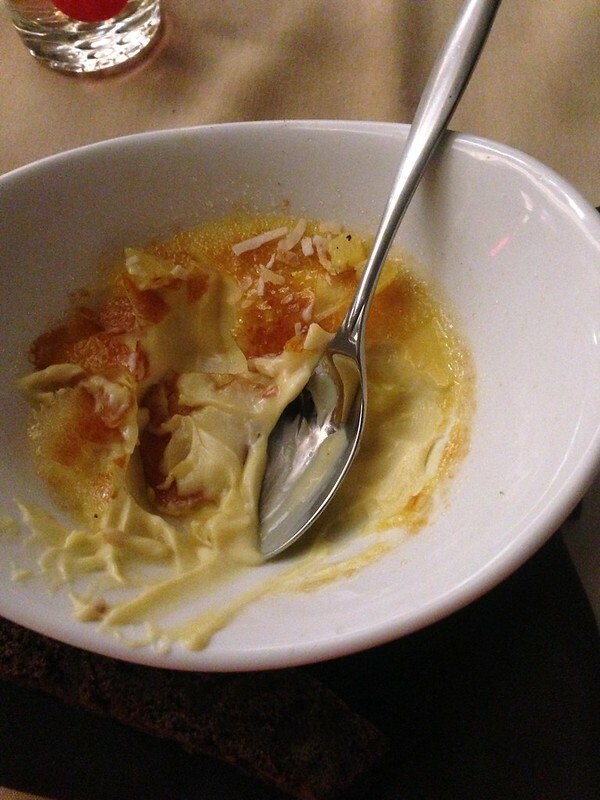 To finish off, I went for the coconut-rum creme brulee which came with a proper crust and was topped with toasted coconut flakes and pineapple which may have been steeped in some syrup. There was a chocolate biscotti to dip but I didn’t take too much to it. 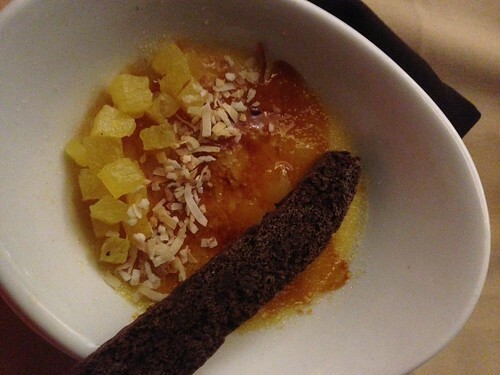 I was content with the brulee and its tropical trimmings. The custard underneath the sugared crust was delicious – creamy, smooth, light and definitely a great finish to the meal. 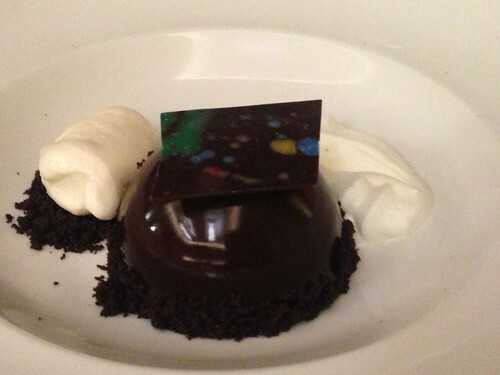 The husband had no dessert but all three kids went for this chocolate plate with a half-bombe of chocolate mousse, covered with a shiny glaze and topped with a sheet of chocolate. To the left, sat some chocolate icecream. It looked like vanilla but tasted like chocolate- molecular gastronomy again! On the right side, sat some airy and light whipped cream ..and all this sat on chocolate nibs/cookie crumble base. My son had a clean plate and ended up finishing what his sisters had left over! All eateries in the institute were kid-friendly and provided great meals for the entire family. 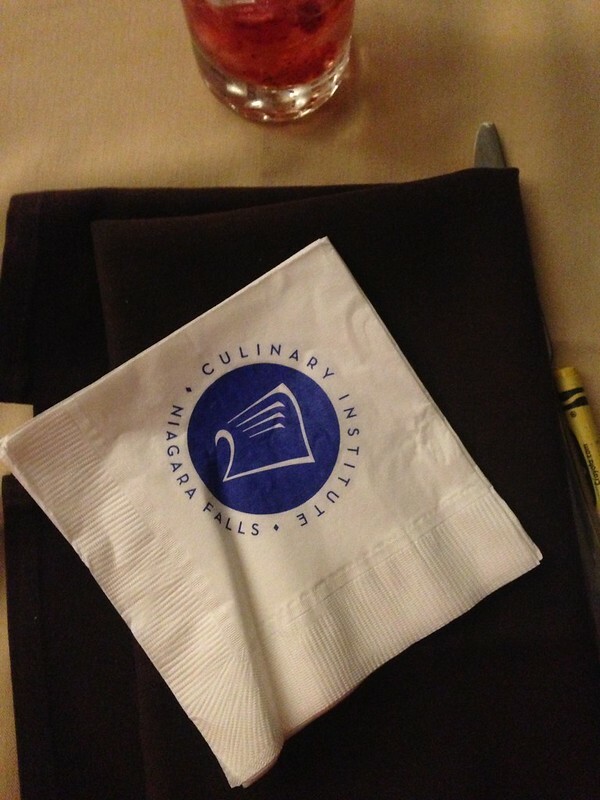 And I got close to my first culinary institute. Win-win.